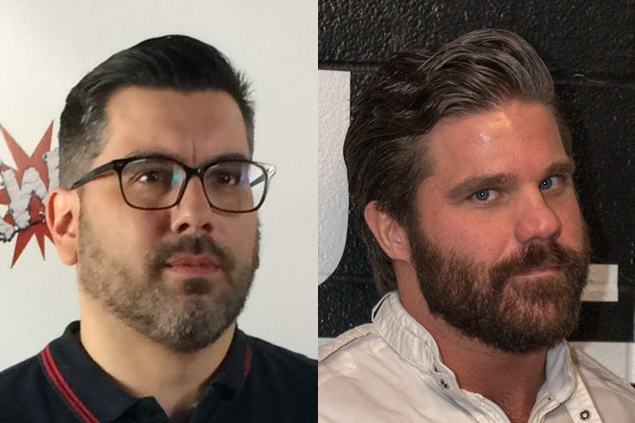 DEFY’s 2nd Anniversary just landed two gust Co-Hosts as DEFYNOW’s Rich Bocchini and Joey Ryan will step in for Steve Migs to both ring announce and lead the DEFYANCE in getting LOUD. Migs, who is the drummer for BRUISER BRODY has a show the same night as NEVER DIES and will return with PDX Slamtown as DEFY Host. DEFY NEVER DIES is in Seattle at Washington Hall on January 19th and features SCU (Christopher Daniels, Frankie Kazarian, Scorpio Sky) vs TEAM DEFY (Shane Strickland, Randy Myers, Schaff), and DEFY Champion Artemis Spencer battles Dezmond Xavier, plus more! DEFY Throwback Thursday: Dezmond Xavier vs. Scorpio Sky from DEFY REQUIEM at The Historic Washington Hall in Seattle Washington. VIDEO: Johnny Defyance, meet Weirdo Hero. Watch a new DEFYNOW! WATCH JOHNNY DEFYANCE BATTLE RANDY MYERS, THE DEBUT OF RICKY STARKS, SCHAFF, LUCHASAURUS, KING KHASH - ALL ON THIS WEEK’S NEW EPISODE OF DEFYNOW !! COMING TO YOU FROM DEFY LOUD, WATCH THIS WEEK’S DEFYNOW BY SUBSCRIBING OR RENTING ABOVE! Subscribe to DEFYonDEMAND.com for just $3.99 per month! VIDEO: Watch DEFYNOW for FREE this week! Coming to you from DEFY LOUD and featuring the explosive main event of TEAM SWERVE vs. MJF and AMERIKAN GUNZ watch this week’s DEFYNOW for FREE! New weekly video series DEFYNOW starts Friday, March 16th!! DEFY Wrestling is pleased to announce the next phase for DEFY video content with a new weekly streaming program entitled DEFYNOW. The DEFYNOW moniker, previously used as an event title for smaller scale live events will now be the name for DEFY's flagship online program - featuring matches, interviews, and promos directly from DEFY live events, DEFYNOW will also incorporate documentary-style pieces and music videos to create a "television-like" experience in a shorter format. The first episode of DEFYNOW will be available starting next Friday, March 16th for subscribers to DefyOnDemand.com - as well as partner channels such as HighSpots Network, Demand Progress, PCW Ultra On Demand, CZW Studios and more. In the near future viewers can expect DEFYNOW to appear on the IMPACT Wrestling streaming platform GWN, in addition to being featured on the Amazon Prime channel "Powerslam Wrestling Network". For the first time, (and very soon) DEFY programming will be available on AppleTV devices. DEFYNOW launches next week, Friday, March 16th with action from DEFY9 from Seattle's Historic Washington Hall. The episode features fan favorite Rich Bocchini on play by play, the full uncut Randy Myers vs Sami Callihan match (previously only seen on IMPACT Wrestling TV) as well as the Amerikan Gunz vs the team of Nelson and Xstatic. Be ready for DEFYNOW and subscribe to DefyOnDemand.com to catch up on all DEFY's past events including the freshly dropped DEFY8 "Kings Among Men" featuring one of the best matches of 2017 in Shane Strickland vs Matt Riddle.